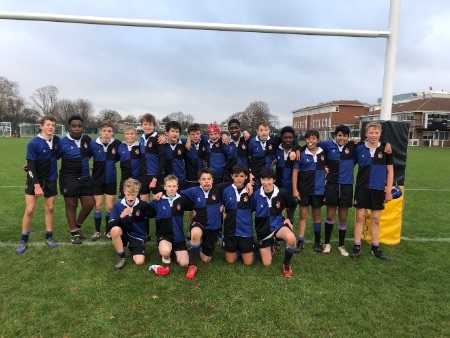 The U14 B's finished the season with a fantastic performance against a Hampton team that refused to give up and kept searching for a try right until the very end. The performance from the Dulwich boys was full of everything that we have been working on all season. The forwards carried with pace and power, refusing to die with the ball, and the backs attacked with precision and some excellent handling giving Hampton plenty to think about. As a team they defended like their lives depended on it within the framework that we have worked on. The boys have also played with a smile on their faces and enjoyed working hard together. We are now very much looking forward to the Rugby 7's season and implementing many of the skills that they have worked on in the shorter format of the game. The main thing that I hope the boys have learnt is that there is no substitute for hard work, to look at themselves, their preparation, their training and how much effort they have put in, before starting to look for any excuses.